The idea of placing the electric motor inside a wheel has pros and cons and so far only Protean and Michelin have developed working models. Protean has now secured an additional $80 Million. The Protean Electric company is a global player in the development and commercialization of in-wheel electric drive systems. The company has secured $84 million in new funding from a few ventures capitals and cities. GSR Ventures, New Times Group, Oak Investment Partners and the city of Liyang, Jiangsu Province, China have given the company a vote of confidence and the money will go for production of its in-hub electric wheel at the manufacturing facilities in Liyang. Technically Speaking. The fuel economy improvements, according to Protean are substantial depending on which type of vehicle you use, up to 30%, which also depends on battery size. It is, as of today the highest torque density than any of today's leading electric propulsion systems with 81 kW, 110 hp and 800 Nm, 590 lb.-ft. of torque in each motor. The weight of 68 lb, 31 kg per motor and fits within the space of a conventional 18- to 24-inch road wheel. Its regenerative braking capabilities allow up to 85% of the available kinetic energy to be recovered during braking and the company plans to begin its prototype motor production early next year in China with an anticipated full volume in 2014. Protean’s Wheel. In my interview with Ken Stewart, Ken explained how Protean’s electric in-wheel system differs slightly from Michelin’s Active Wheel in that it takes an electric motor and turns it around into a wheel. But Protean’s system goes even further by offering redundancy by segmenting parts of the in-hub motor in case of highly improbable failures. The system was demonstrated on Mercedes BRABUS full electric and hybrid vehicles, and featured at the 2011 Frankfurt Motor Show, as well as demonstration vehicles, a Ford F150 pick-up truck, Volvo C30, Vauxhall Vivaro cargo van, and a Guangzhou Automobile Company Trumpchi. Bob Purcell, chairman and CEO of Protean Holdings Corp. was quoted as saying: "We will have the capability to directly supply our motors at lower volume levels, while providing licenses to our higher volume customers and partners." "We have a very unique value proposition: We can create hybrid and electric drive vehicle options, on the vehicles that people like to drive," Purcell said. "We can provide more power, better fuel economy, easier integration, and lower cost. The Protean Electric drive system is probably as close as the industry will ever get to a bolt-on solution." It’s good to see ingenious solutions for hybrids, plug-in hybrids and electric cars and in-wheel electric motors will play an important role. 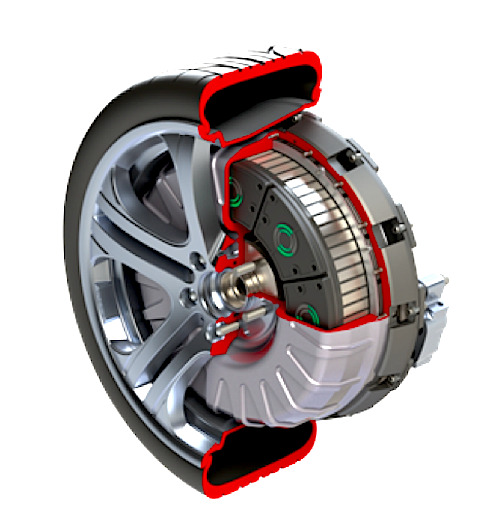 With Proteans’ new round of funding, the company is now moving closer to manufacturing its in-wheel electric motor. Updated on May 11, 2018. Hi Iyengar, thank you for your comment. My wife and I love India and we are familiar with the Rickshaws. I think a better system for the Rickshaws would be the bicycle in-wheel electric motors. They offer a more favorable weight to torque ratio. The Protean in-wheel electric motors are heavy for such a light vehicle. I know New Delhi did a lot to convert Rickshaws to CNG but electricity would be even better. Let us know if you ever work on that. Would would like to hear about how things are moving over there. What part of India are you from? Hi Renga, We landed in Chennai and love Tamul Nadu. My favorite place was Pancheekuram. I was just talking about it yesterday with my Ayurvedic doctor. Funny. The other problem you have in India is the electricity access and water. If water can go further inland with electricity, it would make sense to bring in more EVs. What is that Indian EV company? I saw a shop in Pondeechery. Those cars are a good platform to start with. While lead batteries is a good start, they life expectancy and overall cost might not make them worthwhile in the long run. Then again paying upfront for a lithium is steep. It's a tricky balance. I hope to see in the news you were the one who got Chennai to switch its Ricks to electricity. Next time I'm there, I'll give you a shout.